When an eccentric family meets in their uncle's remote, decaying mansion on the tenth anniversary of his death for the reading of his will, murder and madness follow. Scientists use a gigantic drilling machine for an expedition to the center of the earth. Price: [to Marion Turner] You know, without your glasses, you're a very pretty doctor. Q: What different versions do exist of the film? 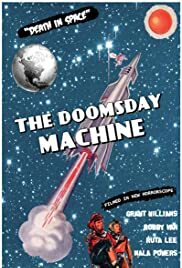 Considering that most of the film was made in 1967 and then sat on a shelf for nearly a decade before it was completed, you certainly can't expect much from "Doomsday Machine". What's worse is that none of the original actors were used in the new footage--making the final product rather incomprehensible. When the Americans realize that the Chinese are about to deploy a doomsday device (thus killing EVERYONE), they quickly scramble to add women to the already scheduled flight to Venus--in the hopes that this crew can continue the human race. No matter that their space suits consists of silver motorcycle helmets AND the actual atmosphere of the planet will both crush them all to death AND it's deadly poisonous AND hotter than the temperature of most ovens! Sounds like the Garden of Eden, huh?! Most of the rest of the film consists of the folks on the ship over-emoting--yelling and trying to get noticed by the camera. It also consisted of the crew of men becoming VERY horny--and fights broke out among the crew over who would have the privilege of inseminating these three space gals. Ultimately, a disembodied voice tells the humans to get lost, as they destroyed the Earth and Venus wants no part of them...and the movie ends! All in all, a very dull movie that is, at times, unintentionally funny--BUT DULL. Not exactly among the worst films made...but close. As far as the special effects go, they were state of the art in 1960. However, by 1976 they were VERY outdated and the film looks downright cheap. By the way, look carefully for tiny roles by Mike Farrell and Casey Kasem. I give "Doomsday Machine" a score of 1 as it's an incredibly dumb mess. A thoroughly bad film, by the end it completely gives up on trying to make any sense at all. I have no idea what the story is behind this film, but the project comes off like 4 or 5 different films all sloppily pieced together. The film begins as an espionage film—with some Chinese folks breaking into a top secret (and easy to break into) government base. They learn by looking at some silly props in a cage that it's some sort of doomsday machine—though how they know this is completely baffling. Next, a US space mission to Venus is quickly altered. No, they haven't called it off because it's impossible to land there due to the planet's crushing and toxic atmosphere (real facts can't get in the way of this film!). It is to substitute a few hot ladies for some of the crew. This is in case the doomsday machine is used, they might be able to send horny men and women into space to continue the species. This isn't a terrible idea for a film. HOWEVER, the execution is so terrible you have to see it for yourself. First, the astronaut outfits and ship look as if they are from a 1950s hokey sci-fi film---even though this movie was completed(?) near the time "Star Wars" debuted. Next, during their trip through space, you randomly see clips from earlier sci-fi films—some of which are Japanese! You also see models of the Earth that look like they came from the 50s as well. As far as the acting goes, it's just bad—and you know that if Bobby Van gets top billing you are in for trouble. But the most awful aspect is the ending. The last 15 minutes or so were obviously tacked on later and is 100% INCOMPREHENSIBLE. They put space helmets on two people who are NOT from the film to hide that they aren't and they pretend to be Van and his new girlfriend—though their voices aren't even close and their space costumes are different!! Then, a disembodied voice gives a long-winded speech and the film abruptly ends!! You just have to see it to understand what a terrible mess it all is—so bad I can't see how this film was ever released anywhere!